You know when you go to a crowded bar, and all you want is a fizzy/pretty cocktail, but you have no idea what's on their cocktail menu, so you just freak out, finally get the bartender's attention + order a white wine? Yeah, I hate that because that's often me. But if I could really take a step back + choose any cocktail to order, this spiked pink lemonade would likely be it. This is a refreshing sipper for the summer--it's lemonade, it's white wine + it's slightly bubbly. At the end you have a beautiful (+ cold!) cherry to enjoy too. In a large pitcher, combine lemonade, pinot grigio + seltzer. Stir to combine. Add the teaspoon of cherry juice, stir. You can add more for the desired color. 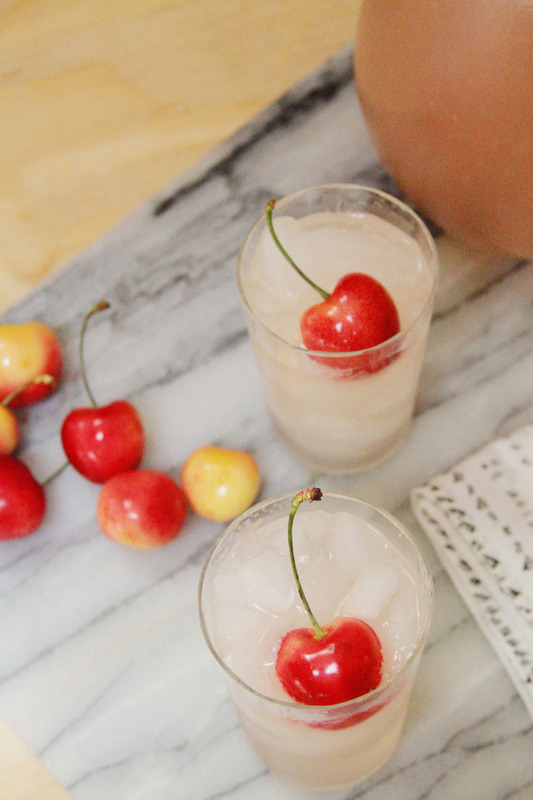 Serve in small glasses with plenty of ice + a cherry for garnish.